During the spring and summer of 1954, the Korean War was over and the Army was for the most part back home, "the Big Green Machine" found itself under the withering gaze of arch Communist hunter, Senator Joseph McCarthy. Rather than find itself another institutional victim of the witch hunt, the Army did what it does best, fight. Most of the people still considered Communists and Communism a danger to the nation and the American way of life, but more and more they were turning away from the bluster of McCarthyism and finding themselves under a spell cast by a former truck driver from Tupelo, Mississippi. As the year progressed we will saw increasingly disturbing reminders that we entered the Atomic Age, a hopeful sign for the future of nuclear power occured on January 21 when First Lady Mamie Eisenhower smashes a champagne bottle in Groton, Connecticut, and the USS Nautilus slid into the Thames River. Although the boat was technically a weapon of war, the prototype of its power plant was providing cheap electrical power in Idaho. Deadlier manifestations of the atomic age was be seen beginning in March with Operation Castle, a series of test detonations at Bikini Atoll in the South Pacific. The first shot, "Castle Bravo", was a 15-megaton blast, more than two and a half times the expected yield. The huge amount of fallout from the test was said to have been the inspiration for Ishirō Honda's iconic film Godzilla (1954). Blonde bombshell Marilyn Monroe tied the knot with baseball great Joe DiMaggio in January, but youthful rebellion is beginning to invade the national mood. Kids were flocking to theaters to see Marlon Brando in The Wild One (1953) and in April Bill Haley and His Comets record "Rock Around the Clock" for Decca. It wasn't the first Rock and Roll record, but its driving beat and catchy lyrics helped it become an anthem of playful rebellion. A few months previously, a youngster named Elvis Aaron Presley walked into the offices of Sun Records in Memphis, wanting to cut a disk of a gospel song as a present for his mother. When studio owner Sam Phillips heard the recording, he asked Presley to come back. At a session which lasted well into the night in July, Presley and his backup musicians began fooling around with an old blues tune called "That's All Right Mama". Hearing the upbeat tempo that they were using, Phillips insisted that they start over again so he could record it. "That's All Right" (with "Blue Moon of Kentucky" on the B-Side) was released on July 19 and immediately started to get airplay in the Memphis area. Local disc jockeys took to the record because it had a strong rhythm and blues feel but was sung by a white artist. On March 9, the CBS TV News Department program See It Now starring Edward R. Murrow and Fred Friendly broadcast a story titled "A Report on Senator Joseph McCarthy". The program criticized the Senator's methods wherein suspicion and accusation were often accepted as guilt. The report served as a reminder that, "the line between investigating and persecuting is a very fine one, and the junior senator from Wisconsin has stepped over it repeatedly." On January 30, McCarthy subpoenaed an Army dentist who had refused to list his political affiliations on a loyalty form. When the dentist appeared before the committee he invoked his fifth amendment rights and McCarthy demanded that he is court-martialed, which the army refused. The Army accused the Senator of pressuring for favorable treatment for a former McCarthy aide who was then serving as a private after a fruitless investigation of the Signal Corps Laboratory at Ft Monmouth. The Senate finally decided to investigate the conflicting charges and the hearings were given "gavel to gavel" coverage on television. When the Senator accused an attorney on the staff of the Army counsel's firm of belonging to the National Lawyers' Guild, a group identified with Communist affiliations, the Army's lawyer Joseph Welch turned on McCarthy, saying, "Senator, may we not drop this? We know he belonged to the Lawyer's Guild ... Let us not assassinate this lad further, Senator; you've done enough. Have you no sense of decency, sir? At long last, have you left no sense of decency?" On December 2, the Senate voted to censure McCarthy, although he was not expelled from office his influence and effectiveness as a politician was gone. In South East Asia, the Battle of Dien Bien Phu was fought between French Colonial forces and the Communist Viet Minh from mid-March until May, resulting in the defeat of France in its colony of Indo-China. More than a month before the battle, President Eisenhower increased a military aid package for Vietnam from $400 million to almost double but warned his nation against becoming involved in the conflict. After the Geneva Peace Conference, Vietnam was divided into the Communist North and a Western-supported Republic in the South, although both sides claimed to be the legitimate government of all Vietnam. The last new episode of The Lone Ranger is broadcast on the radio on September 3, although recorded repeats will broadcast for several years. The runs of Quiz Kids, Dr. Christian, Broadway is My Beat, and Escape on CBS, The Six Shooter, and Rocky Fortune on NBC, Mutual's Bulldog Drummond, and ABC's The Adventures of Ozzie and Harriet all came to an end. 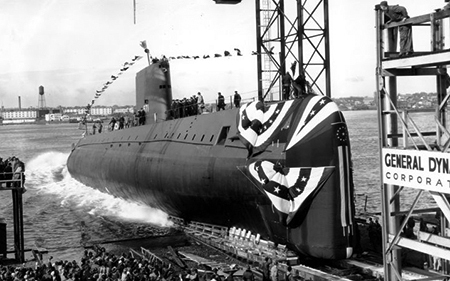 First lady Mamie Eisenhower launched the USS Nautilus on January 21, and the historic first nuclear powered submarine is commissioned on September 30. The Castle Bravo thermonuclear device, a hydrogen bomb was detonated in the atmosphere above Bikini Atoll on March 1, with a yoeld of 15 megatons, two an a half times what was expected,caused such a large cloud of fallout that an international clamor arose to ban atmospheric testing. The first Godzilla picture debuted in Tokyo on November 4. 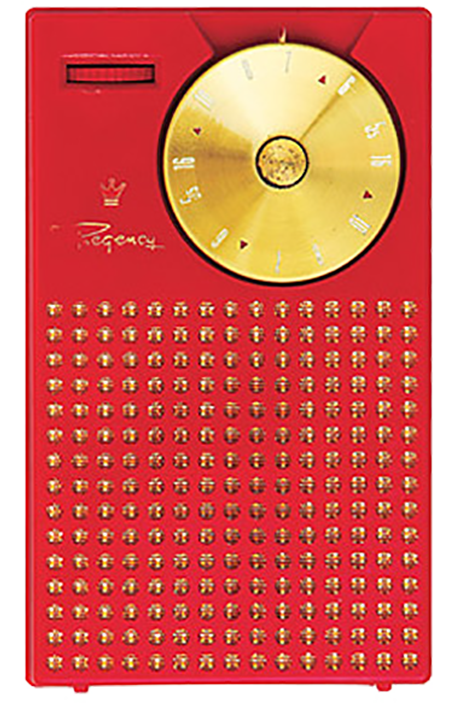 Texas Instruments announced production of the first consumer transistor radio, the Regency TR-1, on October 18, previously transistor technology had only been applied in military and industrial applications. In the Brown v. Board of Education case, the Supreme Court unanimously ruled that school segregation is unconstitutional. 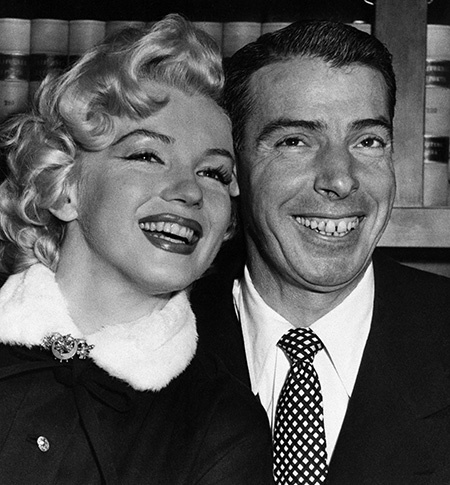 Baseball hero Joe DiMaggio married Marilyn Monroe on January 14. RCA's first color TV with a 12 inch screen was made on March 25, selling for $1,000. Bill Haley and His Comets recorded "Rock Around The Clock" in April, marking the start of the Rock and Roll craze. Sun Records released "That's All Right", Elvis Presley's first single on July 19. 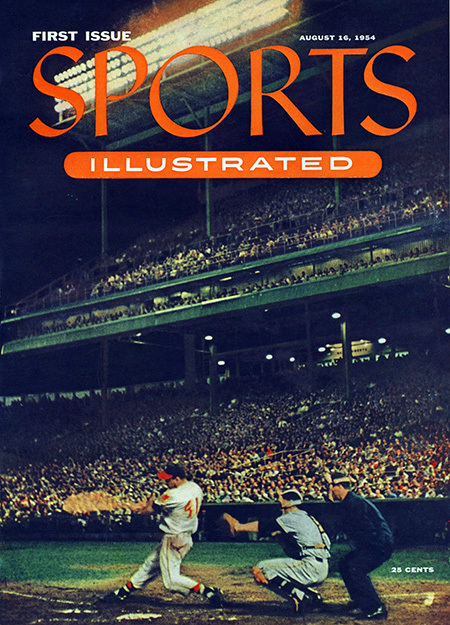 On August 16, the first issue of Sports Illustrated hit the news stands. The first Burger King restaraunt opened its doors in Miami on December 4. The Pledge of Allegiance to the United States was modifed on June 14 with the addition of the words "under God". CBS TV's See It Now program starring Edward R. Murrow and Fred Friendly broadcasts a story titled "A Report on Senator Joseph McCarthy" on March 9. 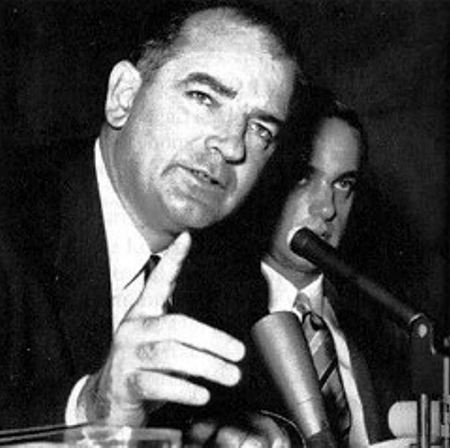 On April 22, Senate Hearings opened to investigate McCarthy's accusations that the Army is "soft" on Communism. Special counsel for the Army, Joseph Welch, lashed out at the Senator during the hearings on June 9, asking "Have you, at long last, no decency?" McCarthy is formally censured by the Senate on December 2, one of the few members of that body to ever by so disciplined. $400 million is budgeted for military aid to French Indo-China. On February 10, President Eisenhower authorized another $385 million, but warned against full-scale intervention (American military advisors had been on the ground since 1950). Viet Mihn artillery engaged fortificationns manned by elements of the French Far Easern Expeditionary Force on March 13, beginning the Battle of Dien Bien Phu. On April 7, President Eisenhower explained the importance of Indo-China/Vietnam in his "domino theory" speech. 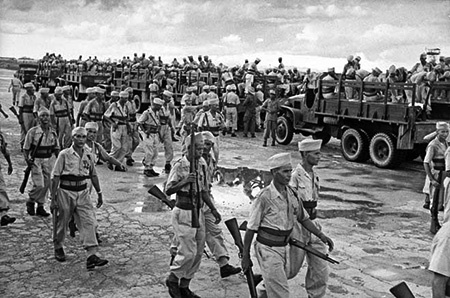 The French concede defeat at Dien Bien Phu on May 7. In accordance with the Geneva Accords,Vietnam is partitioned at 17th Parallel between the Communist North and the Western-backed South. 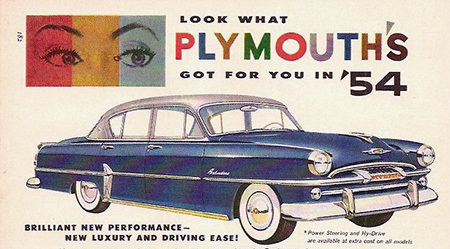 The Belvedere becamePlymouth's top-of-the-line offering with convertible, two-door station wagon, four-door sedan, and two-door "Sports Coupe" models. The Toyota FJ Series Land Cruiser was introduced and will become one of the first widely exported Japanese vehicles. The Subaru 1500 was introduced in Japan, but the Subaru brand will not enter the American market until 1968. On Jan 1, the Rose Bowl and the Cotton Bowl were the first sproting events to be televised in Color. Be the first to comment on "1954"
Guns 540920 ep127 F. U.